Urgently evacuated during the crisis, the NGO staff gradually returned. The church staff and missionaries did not leave the field; some shared the fate of the communities in which they worked, in their forced displacement and their suffering. At Juba churches were a place of refuge. When I went there, many had left the parishes where they had taken refuge. 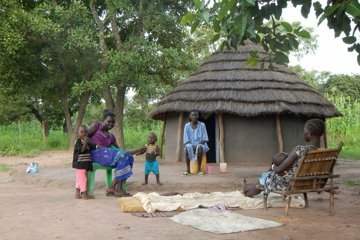 But at Gumbo on the outskirts of Juba Father David, a Salesian from India, has offered them hospitality for six months without support from international institutions: "We welcome 1600 displaced persons on our land, including 1,200 children, under 290 plastic sheets. They came at night. The men stayed to fight. Cholera has affected us but now the situation is under control." 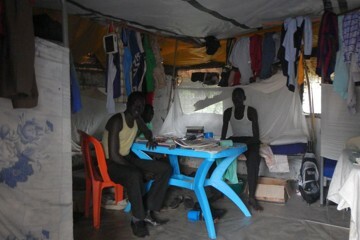 Sister Eugenie works in both camps run by the United Nations in Juba. She steered me through the maze of alleys and passages between the huts. "The hardest part is inactivity for the men. There is no work." The water of the Nile comes by means of tank trucks; it is stored in tanks and treated on site. The Lakes State in the center of the country is a region of forest and swampland. During the rainy season the roads are impassable. 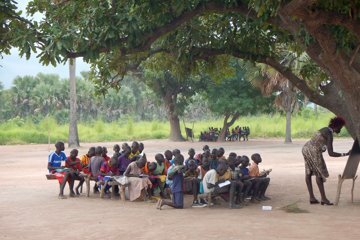 It takes almost three hours to cover the 60km that separate Rumbek, the capital of the state, from Mapuordit. In that large village, 53 boys from the fifteen parishes of the diocese reside as seminarians in their dorm rooms at St. Bakhita minor seminary. They study during the day at the nearby high school. They welcomed me for three days and we shared, in their free time, times of prayer and bible reflection. Daniel Ranthiar is now a father twice. Without having himself finished high school, he has become the deputy director. On his land he welcomes eighteen girls from remote villages so they can more easily get to school. But living conditions are very simple. The menu is the same every day: rice and red beans. No electricity and especially no water, ever since the neighborhood pump stopped working. That is the problem of the whole village, of sixteen pumps only three still work. Many will fill jerry cans from the tap at the seminary. People try to recover rainwater "but it is not clean!" There remain the muddy puddles where mothers come to fill their earthenware pots with a cup. 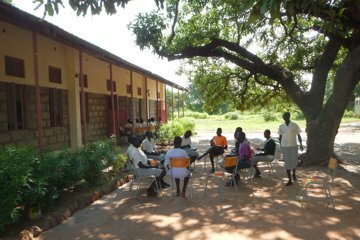 The Sisters of Loreto at Rumbek put all their energy and skills to the service of a cause: the education of girls. 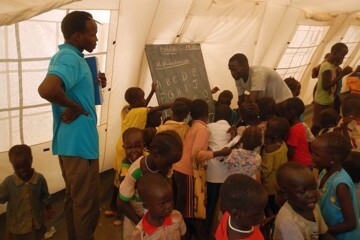 In Dinka territory this is an urgent need and a considerable challenge. The girls are all intended to be married in exchange for a dowry in cattle, for which the whole extended family of the future in-laws is asked to contribute. According to the requests, the father can decide overnight to marry his daughter who now "belongs" to her in-laws who had to contribute to the dowry. Sr Orla is the director of the school: "Every week we have a request to remove a student from school. Sometimes we manage to convince the family that it’s better for everyone to let her finish her studies." We meet to start reflecting and to set up the prayer times with all the students. Some were already leaders last year and are a well-motivated core. They have continued to prepare prayers in school throughout the year. The theme this week: "Becoming leaders according to the Gospel." We develop it in three stages: how to be a leader in prayer, in the service of others, in proclaiming the Word of God. At 2:30pm a biblical reflection begins, followed first by 45 minutes of personal reflection and then sharing in small groups.